Just a quick note on this morning’s economic data. This is of a piece with yesterday’s December permits and starts data. Both metrics are down, but look likely to bottom within a few months in response to lower long term interest rates. As you can see, this metric is doing very well. The important thing here is that, unlike the manufacturing index, which is a leading indicator, services are a coincident, and possibly even lagging indicator (look at 2008). 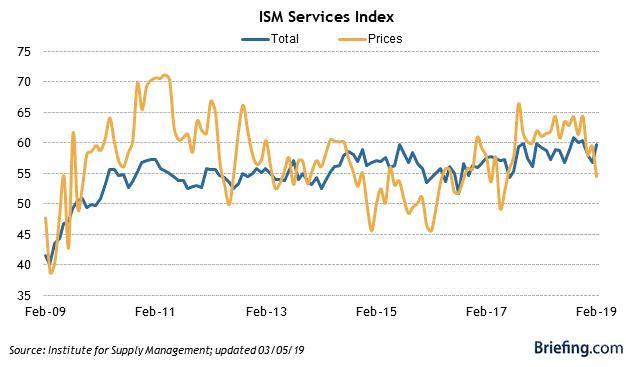 If and when ISM services slips to 50, that will probably mean that a recession is imminent or has already started. But no worries for the moment!